and claim our old rooms. from the ice chests in the trunks of cars. resort to family albums, dusty with accumulated years. that give a meaning to the name of scrapbook. we draw together over simple common images. that keep flying off to it. I take her hand, grateful for her survival. everyone else sealed up in this peeling album. We put them to sleep again as we close its cover. the family scrapbooks under hers. The prompt words are past, video, listless and dependent. This entry was posted in family relationships, family stories, Family vacations, Poem, Poetry and tagged family albums, family reunion, FOWC, One Daily Prompt, poems about sisters, RDP, Word of the Day on November 13, 2018 by lifelessons. This entry was posted in Family, family relationships, Family vacations, Fashion and tagged family pictures, Family relationships, harmony, images of families, photos of beach, Wordpress Weekly Photo Challenge on March 7, 2016 by lifelessons. The Prompt: Retrospectively Funny–Tell us about a situation that was not funny at all while it was happening, but that you now laugh about whenever you remember it. Because my father was both the youngest in his family by quite a few years and also waited until he was older to get married, and because I was the youngest in my family, it meant that I had no cousins my own age. My mother’s nieces and nephews were eleven to twenty years older than me and lived a day’s drive away, so although I heard about them and saw pictures, I only actually met them a few times during my at-home years and even their children were not my age, but quite a bit younger. In addition, although we lived in the same town as one of my dad’s sisters, her children were even older than my eleven-years-older sister, so again, no cousins my age. My dad’s oldest sister had seven sons, but all were closer to my parents’ age than to mine and although there were rumors of their kids, my second cousins, being close to my age, they lived far away in Idaho–a three days journey or more on the two lane roads of the fifties. As friend after friend had cousins come to visit in the summer or had them close at hand to make family holidays and dinners interesting, I, alas had none. But one summer I hit pay dirt when for some reason or other, six of my Aunt Margaret’s seven sons all traveled through South Dakota at one time or other during the summer and all of them had kids–MY AGE!!! I was in heaven. Add to that the fact that most of those kids were boys and I was just at the age where I had started to be interested in boys, and you can imagine what a good summer indeed it was for me. My mother handled the situation of having so much company in one three month period by having a set menu that she served each time–baked ham, potato salad, baked beans and cherry pie. Our laden cherry trees in the back yard furnished adequate cherries for pies for an army and for those early visitors who got there before the cherries were ripe, there were still pies in our freezer frozen the summer before. My mom had it covered! One of our first families to visit was my cousin who had been a Quaker missionary in Kenya. Chills ran up our necks as he told about the Mau Mau uprisings and how he and his family had just happened to be gone the day they came and raided the mission to come kill them. These kind of stories had never before been heard in my family, and we were all both rapt and perhaps a bit grateful for our boring lives in a very small isolated town in South Dakota. Then came the visit of my cousin Pam, who sent me a little doll to add to my collection, complete with outfits. Another family consisted of three boys who later sent me stamps to start a collection. A younger girl cousin, asked to spend the night, grew weepy towards midnight as my friend Rita and I were trying to show her how fun it was to stay up all night. My folks ended up having to call her folks at the motel to come get her. What a baby! The best visitor of all, however, was my cousin Buddy. He was just my age and when we rode down the street on bikes–me on mine and he on my older sister’s–I imagined that people might think I had a new boyfriend. He showed me his coin collection, which traveled with him, and even gave me some coin protectors for the silver dollars my dad had given me. My friend Rita flirted with him, but he was even more innocent than we were and I think he didn’t quite understand. Nonetheless, I was interested in impressing Buddy and was on my best behavior. It seemed to be working until a little incident in the kitchen when he politely asked if I could tell him where the lavatory was. Now I had only heard this term applied to a sink and so I blithely said, “Oh, just use the kitchen sink!” His look of astonishment should have told me that something was wrong, but it never occurred to me that he was asking for the bathroom. In short, a place to pee! I can’t remember how this issue was resolved. I am sure he didn’t pee in the kitchen sink and that he was somehow routed to the correct facility by another member of the family. The fact that I remember his shocked face to this day indicates to me that perhaps this is one of those most embarrassing events that somehow over the years has transitioned into a funny story–and the fact that I’m telling you proves it! A few years ago, I found an email from one of my cousins (whom I hadn’t seen since I was 11) when I for some reason checked out at an old email address I hadn’t used in years. In it, he identified himself as the baby being held in the arms of my grandfather in a biographical book of poetry I had written about growing up in South Dakota. He had somehow found a copy of the book and found my email address in the book! This started a correspondence with the result that both of my sisters and I attended a family reunion of his family in Idaho. 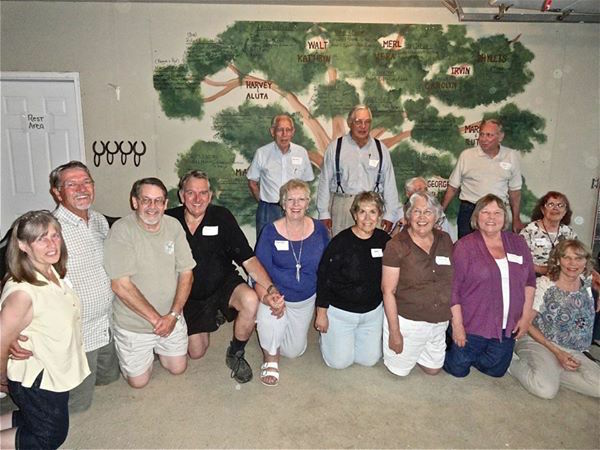 Below is a picture of some of the cousins and second cousins (from that summer of the cousins) I reconnected with at that reunion, which was attended by hundreds of their children, grandchildren, great and great-great grandchildren! Finally, I had as many cousins as a girl could ever want! This entry was posted in Family, family relationships, Family vacations and tagged childhood memories, childhood stories, cousins, Daily Post, Daily Prompt, funny stories, most embarrassing moment, stories about not understanding a word on September 9, 2015 by lifelessons. 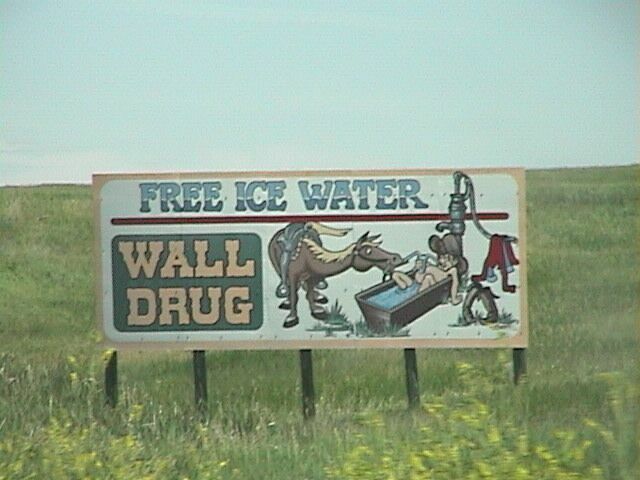 If you haven’t heard of Wall Drug, you probably have never been to South Dakota. Signs for one of the world’s oldest and best known tourist traps are spread out across the state and surrounding states as well as such far-flung locations as Antarctica, Afghanistan and Italy. For me, it was an exciting stop along the only vacation route taken by my family for most of my young life, for Wall was stationed smack dab on Highway 16 between my even smaller town of Murdo, South Dakota and the Black Hills, where our summer vacation usually consisted of an overnight stay in “The Deer Huts” after taking one of my older sisters to the Methodist Youth Camp a few miles away. The excitement of the Deer Huts consisted mainly of the fact that the bathrooms were all outside–little wooden enclosures marked by a half moon that my mother hated and I adored. I loved the nighttime trip up the hill with a flashlight and the strangely reassuring sound of what had once been a part of my body making its dark descent down the long vertical tunnel–as though it was having an adventure of its own. I loved the threat of animals watching me in the dark as I made my way back to the log cabin. It was about as exotic as my life ever got before I finally left home for college at age eighteen and life really began. But I digress, for the true adventure that wound up at the Deer Huts always began when we got to the badlands–a series of sandstone hills and gullies that furnished the background for many a cowboy movie of the fifties. Then, shortly after the badlands, came Wall Drug!. You can read the full story of Wall Drug HERE. If you are pressed for time, however, I will give you the shortened version. The whole phenomena of a drugstore in a small town of under 300 on a godforsaken prairie in the middle of nowhere started in 1931 with a suggestion by the wife of the owner that they put up signs offering free water. From there, the promotions grew into singing automated cowboy orchestras, stuffed longhorn cattle, a life-sized dinosaur, chapels, souvenir shops, other automated scenes, a restaurant offering such South Dakota fare as hot beef sandwiches complete with mashed potatoes and white bread swimming in brown gravy, homemade rolls, cherry pie and 5 cent cups of coffee with free coffee and donuts offered to soldiers, ministers, and truck drivers. I have pictures of me at age eight and age sixty-six, standing by a huge stuffed longhorn steer, bravely touching the horn. The last picture was taken as my childhood friend Rita and I took our last long nostalgic trip across South Dakota. In the Wall Drug Cafe, we shared a hot beef sandwich, a cinnamon roll and a piece of cherry pie for old time’s sake, put a quarter in the slots to see the singing cowboys creak into action, still in tune after almost sixty years. In this more sophisticated age, folks still stop at Wall Drug. It’s possible their teenagers remain in the car, texting their friends or playing computer games with the air conditioning cranked up to dispel the scorching South Dakota summer sun, but I bet the little kids as well as the bigger kids who are their folks or grandfolks still wander the block-square expanses of Wall Drug, looking for thrills from another age and time. And somewhere within its cluster of rooms and passageways, Grandma can still buy an aspirin or get a prescription filled, then get a free glass of water to swallow it down with, Grandpa can still get a five cent cup of coffee and a little kid can taste his first delicious mouthful of South Dakota Black Angus beef, swimming in gravy and surrounded by reassuring slices of Sunbeam white bread and mashed potatoes. The Prompt: Tourist Trap: What’s your dream tourist destination — either a place you’ve been and loved,https://dailypost.wordpress.com/dp_prompt/tourist-trap/ or a place you’d love to visit? What about it speaks to you? This entry was posted in Advertising, Childhood memories, Daily Post, Daily Prompt, Family vacations and tagged family memories, family vacations, Judy Dykstra-Brown, judy dykstra-brown essay, memories, Nostalgia, South Dakota, tourist traps, Wall Drug on February 21, 2015 by lifelessons.